We have been thinking hard to expose ourselves in a product based project. And in the meantime HACKSTER was very helpful in organising their contests with Azure and Artik cloud. We actually tried our best to implement AirLock with Microsoft Azure, But because of LACK OF TIME we couldn't finish that Project. We didn't lose hope and now, We present you the most innovative, interactive way to unlock all your stuff. That is we present you the AIRLOCK. Our aim was to bring an INNOVATION in the security realted area. Really liked working on a product based project. Will definitely load in some more Product Projects in the future. Requesting you that Airlock should also be included as a project in Best ARTIK Cloud & Arduino Mashup section because we have made an innovative product by using Arduino and Artik Cloud. Hoping that you would support us in bringing this innovative product into the market. The main aim of this project was to bring about major changes in the conventional pattern locking system. Traditionally lock has been a mechanical or electronic fastening device that is released by a physical object (such as a key, keycard, fingerprint, RFID card, security token etc. ), by supplying secret information (such as a key code or password), or by a combination thereof. On the contrary to these high cost locks, we have developed a cost efficient electronic lock, which allows the user to lock and unlock a system by drawing patterns in the air. This electronic lock doesn't require the user to carry a key. One has to merely remember the pattern which locks or unlocks the Safe. The Airlock is extremely user friendly, as most of us are found of pattern locks. Hence, drawing pattern in the air is exciting and easy to access. The lock can also be controlled using a web application, which will keep track of each user's login pattern. In order to make these patterns strong, we have added the feature to overwrite the patterns. This feature allows the user to connect even the dots which were previously connected while drawing a pattern. A fine, welded aluminium frame of dimensions 15x15x20 cu.cm was painted in black and used for the construction of the lock. The purpose of using aluminium frame is that it makes the lock unbreakable. Arduino Uno Microcontroller is going to be used to process the analog values read from the IR Sensors and the sensor values are stored depending upon the pattern drawn. These values are later used to compare the pattern with the originally rendered pattern and then open the lock if the values match. ESP8266 will be used as the communicating device between the Web App and the Microcontroller. It is extremely small in size and thus does not occupy much space. The power consumed for transmission and reception of data is approximately 3.3V. It has a transmitter and the receiver. The distance between the finger and the sensor, while drawing the pattern will be sent to the microcontroller and stored as array values. A Web application will be built on Ruby on Rails, to keep track of the different patterns rendered by the different users. Each user can choose their own pattern. This Web Application can be used for adding or deleting the users. Adding users means that the person has to draw one pattern as username and another for password. Red and Green LED's are going to be used to indicate whether the pattern drawn by the user is right or wrong. If the pattern is drawn green LEDs' will glow and if wrong red LEDs' will. A solenoid bolt is a type of electronic-mechanical locking mechanism. This type of lock is characterized by the use of a solenoid to throw the bolt. Sophisticated solenoid bolt locks may use microprocessors to perform voltage regulation, reduce power consumption, and/or provide access control. We used an array of IR sensor which acts like a tool to sense the position of the finger inside the airspace. By knowing the position of the hand and the corresponding sensor values we coded the airlock to get the value as 1,2,3 respectively on the corresponding box where the finger has been placed. We used this circuit to get the values of the position of the hand. So by using this we get the password what the user wants to put and then verify it using the cloud. The Airlock Setup for a Box. We used a simple wooden box and fitted our aluminium Airlock to it. The front side opening space is where we draw the pattern which we want to set as a password. 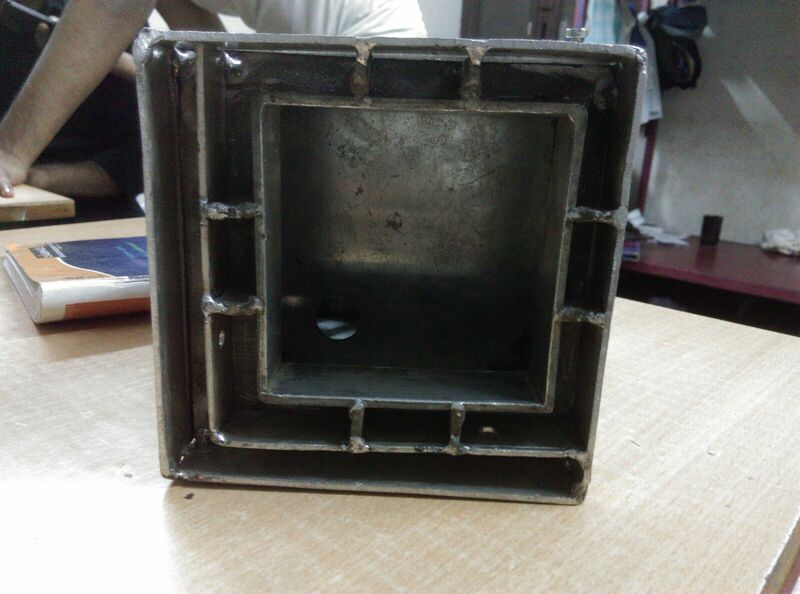 We made the Airlock, unbreakable by any external means and made it really strong for other security purpose. Airlock has its design as a cubical structure. It can be opened from all sides for any services that needs to be done in the future. We have made this somewhat big, but by reducing the component size inside the Airlock, we can make the Airlock size even more slimmer. It can be fitted into the wall or attached to the wall. Since we wanted this to be a product thingy, we made sure that it looks good in appearance. So we thought of Implementing it by means of fitting the Leds in the front side to indicate the user whether he has drawn the correct password or not. If the User draws a wrong pattern then the Red leds alone will glow. If he draws the correct pattern then the Green leds will alone light up. During Normal time all the Leds will Glow. We used a 12V supply from external means to operate the Airlock. Thus we used the above connector to feed in the 12V supply for the Airlock. We made the Airlock a really energy efficient device which can last more days, since it needs to monitor the data always when the user enters a pattern. During the means of power cut, we have included a Battery Backup supply which is efficient for the Airlock to run for few days. Just a connector board for the esp8266 to be fit in place and use it to make the Iot communication to the Artik cloud and log in all the details which it gets from the Airlock. A relay board to switch between the supply voltage for efficient energy usage purpose. The Rear side which has space to fit in all the required boards in place and all the wires. Making it a compact and lightweight was also a concern from our side. Everything can be screwed out and can be fitted in again. The front side which houses all the sensor and collects the sensor values and sends it to the Artik cloud to further make use of the data collected from the Airlock. We thought of a Mascot to represent our Airlock. Like the guardian to all your belongings and doors, we bring you the Airlock as a saviour. Just a note that Airlock has easy service works. Airlock data to Artik cloud. We connected the airlock to the artik cloud and saw the on and off state of the airlock in the artik cloud. We have also logged in the information of how much times the lock has been opened and closed. Next thing is we made use of other device types to send notification to the user when the lock gets opened and closed. We have added the feature for the user to change his password by simply clicking a button in the airlock which requests the artik cloud to send back the data to reset the password. So it will be like a new user. After the welding stage, the complete Airlock. 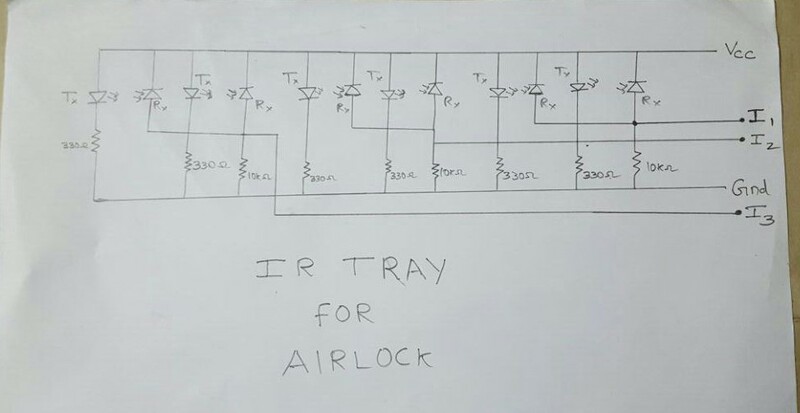 Airlock gets the values from these IR array setup. Helps to Calibrate the sensor values. curl -H "Content-Type: application/json" -H "Authorization: Bearer 687dc03a09374c33b7cbcde5cc7b6594" "https://api.artik.cloud/v1.1/users/self"